The Quiet Fan (sometimes known as Quiet Blade Fan), with overlapping wings, was introduced in 1932, and continued through 1941. The Standard was introduced in 1937, and continued until well into the 1960s. The Vortalex (also called Super-Quiet Fan), with its unique “trailing tip” wings, was designed by W. K. Skolfield, and was introduced in the Spring of 1938. It finally ceased production in 1963. This chronology will cover these three models only. All fans are AC and oscillate, unless otherwise noted. The information in this document is as correct and complete as it can be at this time. The original Quiet Fan had one speed only and had a 3-wing polished aluminum blade. The grille had “S” shaped bars. This fan’s base, cage, and motor housing were black. A 12” Quiet Fan was introduced, as a companion to the 8” model. This version had a 4-wing blade. The 8” was available in black or cream, whereas the 12” came in black normally, but a few were painted in Hunter green. Blades continued to be polished aluminum through the end of production. The Quiet Fans acquired a new streamlined grille sometime during 1936 (early 1936 fans retained the older grille), and a 10” (3-wing) desk version became available, as did 10” and 12” pedestal versions. Pedestal versions were a bronze color with ivory-colored blades. In 1937, a new 2-speed 12” Standard model was introduced, with slender, paddle-shaped wings. This model was, throughout its production, which ended in 1950, equipped with a cardboard base, to which felt had been glued. 10” Quiet Fan pedestal model – Cat. # ?? For 1939, the basic 1938 lineup was carried over, with the following changes and additions: the 16” Vortalex became available as an adjustable-height pedestal, and the 12” Vortalex pedestal acquired the adjustable-height feature. The 12” Standard model received a new front-bearing housing sans grease cup. Form designations disappeared at the close of this year. For 1940, Vortalex 16” and 12” models acquired carrying handles. The 12” Vortalex model acquired a 4-wing blade. The fans were still black with aluminum blades in most cases, but a few 16” and 12” Vortalex desk fans had black blades. All 16” and 12” G. E. oscillators acquired a new oscillator crank disk with 3 connections, to allow 90 degrees, 65 degrees, or 45 degrees of oscillation. A 10” Standard (with red badge and stamped, one-piece blade) was introduced, and most Standards were finished in black from now through 1948. New “FM” numbering system was introduced on some models. For 1941, Vortalex models were carried over from 1940. The Standard line was expanded again to include a 16” model (with aluminum badge, like the ordinary 12” model), a 10” non-oscillating model, an 8” non-oscillating model (with stamped blade), and a 12” 1941-only (possibly early 1942 as well) “oddball,” which had a red badge, a unique blade, and a bullet-shaped motor housing. 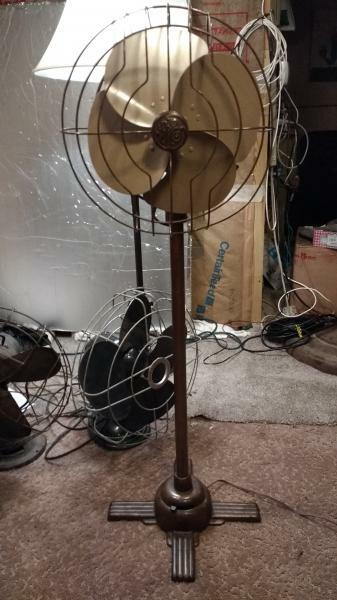 This Hunter-like fan was the only 12” Standard listed in the 1941 catalog, although the 1940-type was apparently still in production. The Quiet Fans ceased production at the close of this year (or possibly early in 1942). All 1938 models had Form Code AT, and most 1939 models had Form Code AU (see below). 1940 and 1941 fans no longer had Form Codes. * It is unknown whether these are for AC or DC models. These are the only numbers known for the 1938-1939 12” and 10” Vortalex fans at this point. **Some with this Cat. # are suffixed with B, the significance of which is currently unknown. Although 1942 Vortalex prototypes were produced and photographed that had the 5x3 grilles and grease cups of the 1938-1941 models, it appears that the production models, scarce as they were, had 3x3 grilles. Data on these wartime models is somewhat sketchy, and should be taken with a grain of salt. The desk models seem to have had brownish-bronze painted cages, tan blades, and forest-green bases. It is uncertain if the Vortalex range and the smaller Standards were produced only in 1942, or if they remained in very limited production during the entire war period; the latter is likely, since fans had become a near necessity. The Standard 16” definitely remained in production during the conflict, primarily for government, military, hospital, and factory use. It is uncertain if DC models were made after 1941. If any were made, they are scarce, and at the moment, there is no data on them. The fans listed in this and subsequent sections, therefore, are AC models. Early postwar Vortalex desk and pedestal models appear to have been painted in the brownish-bronze color only (with blades being tan). Both Vortalex and Standard models were carried over, with Cat. #’s changing slightly. During 1947, the Vortalex models acquired a wing nut to adjust angle. Grease cup was deleted from the gear box, although this may have been the case on the 1942 through 1945 production models. The 24” pedestal of this time period was a 3-speed fan with a choke coil, motor cover, and switch on the motor cover. Circa 1948, the Standard 16” acquired a red badge. At least some 10” Standards were finished in brown, and had tan blades. 10” Standard fixed desk model – Cat. # ?? Both Vortalex and Standard models were painted in a color known as “Gray Mist” (actually a metallic turquoise), and Vortalex models acquired red badges. There is no data regarding the production of a Vortalex 9” fan or Standard 8” fan. It appears the Standard 10” fan was equipped with a rubber hub beginning this year. There does not appear to have been a 16” pedestal. The Vortalex 12” and 10” models acquired the cardboard base used on all Standards since 1937. Early-1949 16” Vortalex fans used screw-on plastic switches, but during the year they were replaced by the snap-in switches of the 12” models. The 24” pedestal continued, and was finished in “Gray Mist” as all the rest of the 1949 Vortalex and Standard fans were. *Suffix unknown at this point. Vortalex models acquired a new chrome concentric-circle grille. There was no longer a carrying handle attached to the 12” model. A new motor replaced the capacitor type (for the 16” Vortalex) and the housing was redesigned to accommodate three long screws to hold the front plate and grille on. Some 16” Vortalex fans made with sliding switch. It does not appear the 12” pedestal model was in production anymore. 1950 was the last year for the 16” Standard, and the current 12” Standard. The 24” pedestal continued unchanged, but this was its last year. A new line of stamped-blade 12” Standard fans was introduced that resembled the 10” version. 1951-1959 12” models were coded F11S106 and F11S125, and 1960-1963 (at least -- late ones were painted in “blue spruce”) 12” models were coded F13S125 and F15S125. Presumably all of these were oscillators. Cat. #’s for fixed ones are unknown at this point.10” 1951-1959 models were coded F12S107, F13S107, and F14S107 (oscillating) and F11A103 (fixed), and 1960-1963 fans were suffixed with S107 (first part of number unknown). A 12” Standard pedestal model appears to have been produced, but the Cat. # is currently unknown (perhaps F12M125). Owing to the plethora of variations of these G.E. fans, there are certainly more Cat. #’s than the ones listed above. These will be added as data is acquired. The Vortalex retained the chrome grille but was otherwise painted Frost Gray (through 1961), and had a red badge (through 1959). The Vortalex went through a few changes, which will be detailed below. Only 16” Vortalex desk fans were produced from 1952 onwards. Thanks Richard,I had looked for their old site just recently and saw that it was down. It was an excellent compilation of the GE vortex and quiet blade fans. I am mostly into cast & brass, but I love the Vortalex fans. I have many and have used that list quite a few times. I sure am glad I had it bookmarked. Great job posting that. As I've said before, we need a depository on the forum site for these posts of high value! It is not just down, it is dead. This is what happens when facebook takes over and dries up traffic on vanity websites. I had Signal information up there as well, but saved it off to my laptop. Richard - it might not be a bad idea to submit this to Larry so it can be posted to the AFCA Site. I'll be doing this with what I have written once I make a few fixes. I'm sorry to hear about DT, spent a lot of time on there when I first began collecting. Does anyone have the Vornado history page that was on there? Tom Morel wrote: I'm sorry to hear about DT, spent a lot of time on there when I first began collecting. Does anyone have the Vornado history page that was on there? Please give Larry a call guys. We really need to get an area started. This, and other information is too valuable to lose or not be able to find. I have much of this type of info printed off and in a binder, but having it in an area here(for members only) to quickly find it would be better. Having it in a member's only area increases the value of membership and also protects us more if any content is copyrighted, since it's not public, and is only for "internal" use. Larry, Alec's post image is a .png file the way it looks, and can't you just use a "snip-it" tool to capture the GE info and post it as a picture??? Yes I see that. I am hoping that there are possibly some html files out there. I can create them if need be. If nothing else if the picture files (whether they are png, jpg, or tiff) are clear enough I can create a pdf with all the info. But if you are in possession of any content, please give me a shout. Okay, grabbed the GE info an added it. It is under the reference section/research projects. Just spoke to Zachary Yarnes who used to be involved with DT and he said he has the files. So if there is anything other than that which is mentioned here, that you'd like, let me know. Thank you very, very much....more than I could expect. This will help tremendously when I give this fan to a very nice friend. VERY MUCH APPRECIATED!!!!! Great background information on a wonderful fan! One of my favorites! Page processed in 0.1793 seconds (12% database + 88% PHP). 28 queries executed.